Today is Homemade Bread Day! There’s nothing more comforting than the aroma of bread baking, unless it’s actually putting your lips around a warm slice slathered in butter. It’s one of the topics I write about frequently; all too often, I’m afraid. Like this one where I sing the praises of bread. And then I posted these recipes that I adore. And there’s more, which is silly, but not, since bread serves as both metaphor and sustenance in so many different forms. Doesn’t look that great to start, but just wait. I plan on baking twice as many loaves as normal today as a way of celebrating this delightful little known holiday. I love sharing my bread. I love the way someone’s eyes light up when I hand them a warm loaf. They all but hug it to their chest. They always lift it toward their face to catch the intoxicating scent. Their eyes almost glaze with a sort of nostalgia, even if they never had homemade bread while growing up. I’d like to bake a fresh loaf every single morning, but that’s not realistic with only two of us in the house. Maybe I ought to take up baking for a living, or at least as a little side job. It’s nice to imagine that a plethora of people want to experience the wonder of an imperfectly shaped but exquisitely flavored loaf on a regular basis. And I’d get the side benefit of a house that always smells like freshly baked bread. Mmmm. I could bake up six loaves every morning five days a week. That’s thirty extremely happy households regularly. Imagine the transformation in a neighborhood if more lips met more fresh-baked dough. Smiles would surely appear unbidden. Forgiveness would spring forth almost instantaneously. Love would definitely find expression more frequently. Random acts of kindness might even become the norm and not even make the nightly news as something amazing and different. And, who knows, maybe even peace on earth might break out for an hour or two on occasion. You laugh. But the power of bread exceeds the power of all other food groups combined. Even (gasp) chocolate! I kid you not. Seriously, if you’re offered a hot loaf of homemade bread or some kind of chocolate, which would you choose? Be honest! If you’re male you most likely picked the bread. Female, you probably chose chocolate covered bread. Am I right? If it’s been a long while since you had a truly home-baked loaf of bread, fresh from the oven, still emanating warmth and goodwill when you laid hands on it, then you’ll have forgotten the joy and true power of bread. You’re overdue for a slice or two. Man may not live by bread alone, but it’s certainly a staple of nearly every culture. Even people with gluten intolerance or celiac’s disease search out replacements for that perfect mix of crusty crunchiness and inner softness. There’s little that can reproduce the oh-so-marvelous sensation of home-baked bread. My favorite one-year old refuses almost all other sustenance aside from bread. Her mother makes a wondrous variety of breads and the child has decided she’s found manna and the promised land all in one food group. Oh sure, she’ll eat the random banana, or a green smoothie sometimes, and she’s okay with pasta drenched in red sauce. But otherwise, it’s bread, or nothing. Smart kid. Done rising and ready to bake! I think I share the same trait. Muffins for breakfast. Bread with butter and cheese for lunch. A fresh loaf, just sliced and buttered, with a few spoonfuls of soup on the side for dinner. I guess I’m not quite a purist. But I could be. Just call me Super Panivore! Surely there’s a cape and tights to go with that, snug fitting but stretchy enough for the bit of tummy bulge sure to accompany such a super hero. You could probably talk me into a loaf if you live locally. Or I might trade you something for it. For instance, I’m getting my lawn mowed for a loaf this week. Really! Hard to say who’s getting the better deal out of it. Someone brought me a Diet Coke yesterday when a headache threatened to take me down, so they’re probably getting some bread this week, too. Kind acts deserve kindness in return, don’t you think? Bread’s not a difficult thing to learn to bake. Usually there’s five ingredients. Water, yeast, sugar, salt, flour. Occasionally a bit of oil or butter, or you leave out the sugar, or milk instead of water. Easy peasey. Really. I’ve promised a bread making lesson to a couple of friends a while ago. I need to follow through with that soon. If you’re curious or feeling adventurous I found two YouTube videos that walk you through the basics of bread baking. I’ve included those links below. Be brave. Be daring. Treat yourself to some love and bake yourself a loaf or two. You’ll thank me or rather, you’ll thank yourself. If all else fails, at least go buy a fresh loaf from a bakery. It won’t fill your house with loveliness, but your mouth will thank you, and so will anyone you share with. Three minutes on the basics of homemade bread. Fifteen minutes of bread making instruction, if you need a little hand holding. It’s that glorious time of year when the perfect pairing of Mother Nature and Enhanced Mother Nature collide in a state of bliss. My taste buds sing, my lips smack, my happy vibes light up. It’s the season for Apples. The perfect all purpose self contained fruit. Colorful, crunchy, sweet and juicy all in one self-contained orb. Perfection. Don’t tell me you’ve never read this Robert Frost poem! It practically proves my point. She scores a pasture withering to the root. There’s good reason cows love apples. It’s a natural pairing. Really! Cows produce milk, cream and ultimately, butter. Add some sugar to those ingredients, boil, simmer, pour and cool. And you have the real reason cows exist: Carmel! Combine warm, melted carmel with an Apple and you’ve arrived at the true taste of Autumn. Oh sure, Apple Pies taste nice. And Apple Fritters deserve mentioning. Apple Crisp tops the list of delectable fruit desserts. But nothing beats a carmel apple for pure delight and comfort. My son invented this amazing life hack that you’ll be grateful for from now until eternity. I’m simply passing it on to alleviate a bit of stress from your world. Look I even asked his permission! Sorry, I don’t have any flashy ads to jump out at you as I dispense this information, or another site you have to click to and then search to find the info I so tantalizingly promised you. I don’t even have fifty other less than stellar hacks for your to wade through. Just this one. 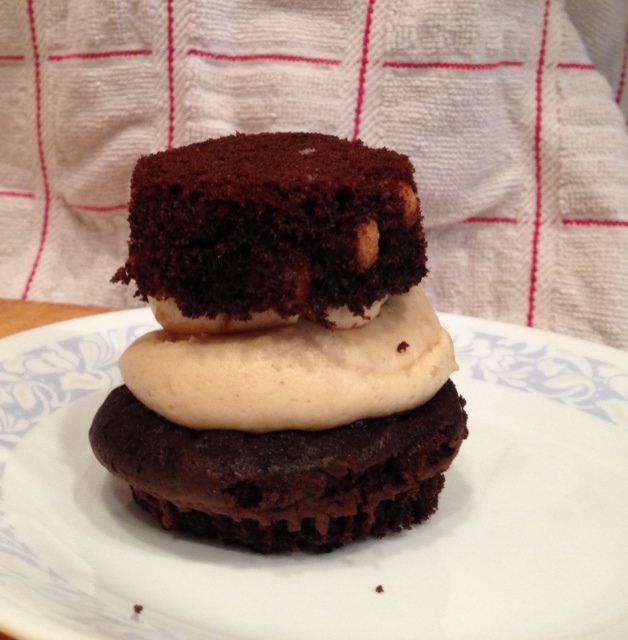 And here you behold the cupcake transformed into a delectable cupcake sandwich, easy to eat and much less messy. Tear the cupcake in half. Turn the bottom half upside-down and place it on top of the frosting. There now. Doesn’t that transform your life just a little? 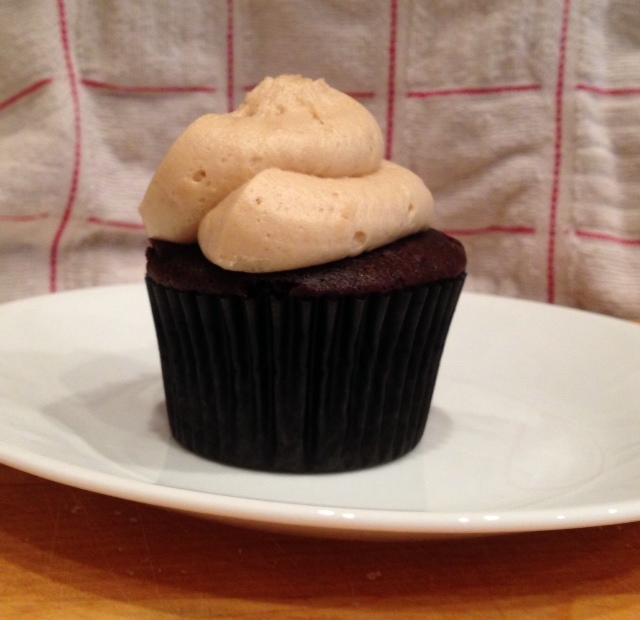 It at least makes you want to go out and buy a cupcake or bake up a batch just to try it out. “You’re welcome,” says my brilliant engineering son. So on Gratituesday this week I waxed poetic about all things bread which you can read here if you missed it. A few recipe requests came my way and I decided that I could definitely oblige. Here, then is my contribution to the carbohydrate section of your recipe collection. Yes, I’ve been lazy and didn’t retype them, except for the last, beyond well-loved and over-used, recipe card. Does anyone know if there’s an app out there for a digital recipe box? English Muffin Bread. It’s a bit messy thanks to the cornmeal, but delish. You’ll thank me for this one once you’ve made it. I’ve tried to give credit where it’s due, but sometimes I have no idea where I found the recipe or who gave it to me, or if it’s their original creation or from a friend of a friend of a friend’s relative. Y’know how that goes. Perfection on a baking sheet. The important thing about the above Braided Bread recipe is to combine the ingredients in order, like it says. I should highlight that in my book. I love this recipe for three reasons: 1) It’s fast. Two hours from “mmm, I want bread to oh, my this is delectable, pass me more butter, please.” 2) It only takes one bowl. I cheater knead it in the bowl and let it raise in the bowl I mixed it in. 3) It tastes like I imagine heaven will taste, if it has a taste. Just as lovely as a food can be. I’ve tried it as a cinnamon and brown sugar braid with icing drizzled over it. Equally delightful. This one, as noted, is from my friend Susan. She’s the kind of cook I’d like to be when I grow up. Anything she sets her hand to makes a person feel loved, comforted and completely at home. Just reading this can improve your mood. Imagine actually eating it. A much-loved, well used recipe card. Bake in a greased and floured loaf pan at 350 degrees for 45-60 minutes, until knife inserted in center comes out clean. So, there you have it. Five of my most beloved recipes. Go forth and bake something for yourself or for someone you care about. Gospel truth. More important than yeast. It’s Gratituesday! Today I obsess about and express thanks for and praise the powers that be for the miraculous marvel called bread. I’m not talking Wonder here either. This morning I’m enjoying the delightful stylings of a new recipe I’d never tried until now; English Muffin Bread. It’s what you’d imagine given the name. Nooks and crannies, slightly chewy but crisp where the toaster has caressed it. Real butter, some grape jelly and the day can’t get much better. Well, the day could get better if I bake my standard bread loaves, a white bread recipe I’ve modified some by tossing in some fresh ground wheat. Mmmm. A slice of that stuff not ten minutes out of the oven atones for most anything I may have gotten wrong throughout the past twenty-four hours. A braided loaf, from flour to finished only takes two hours, and disappears in less than ten minutes when family flocks around. Other favorites? Oh, let me name a few. No. I don’t personally bake all of those, although I’m happy to imbibe. You could almost call my love and adoration of bread an addiction, but we won’t go that far. I will say a meal seems most complete when bread hums a melody alongside the vegetables and meat. I consider far too many meals complete with bread alone, unaccompanied by any other food, except perhaps butter or some honey. The bread-only meal provides most satisfaction when it’s warm and filling the place with the scent of heaven. Is it any wonder that the last meal many people partake of is bread? Not to me. I’ve always envisioned the manna spoken of in the Bible as bread. Freshly baked by angels in bakers hats, to sustain and lift the bodies and souls of the children of Israel. That’s just my spin on it. I couldn’t quote scripture on it. Hardly so. But it’s a nice thought. What else could you eat day in and day out for so long without getting tired of it? My Dad has Celiac’s disease, which means, among a bunch of other not so thrilling things, he can’t eat regular bread. If I end up with that malady just put me out to pasture and let me go the way of all the earth. Oh, sure, he’s adjusted his diet to avoid gluten, but it’s just not the same thing as the breads I know and adore. I shouldn’t be choosy though. I’m filled with gratitude as I eat each morsel and crumb. I recognize the beauty and the bounty of my life and try desperately not to take it for granted that bread will always grace my table. That quote takes my breath away. Makes me want to put on the habit of a missionary and distribute bread wherever I can. When we were dating my not-quite-yet-sweet husband planned a picnic that surely sealed the deal and made me fall in love just a little more. French bread, butter, summer sausage, cheese, complete with glass wine goblets and some bubbly. Not your ordinary picnic faire. But then, this man fell way outside the ordinary spectrum. Impressive. Delicious. Delectable. It’s true. Sure, it isn’t quick. It’ll require that you get out of your car and walk into a store or a deli, but it’s worth a try just this once. Stop in at the deli counter, get a few slices of a cheese that sound interesting and if you must, a few slices of ham or roast or pastrami. Then look at the lovely loaves sitting in their paper wrappers or tucked behind the counter. You can’t go wrong with any one of them. And to make the meal completely decadent, swing by the dairy case and put real butter in your basket. You’ll have a meal you don’t want to eat while watching the evening news or perusing Facebook or email. No, you’ll want to give your full attention to the bread. You’ll thank me. Really. You will. It’s Gratituesday! Occasionally, I’m paying attention and notice detail in a mundane task that transforms the experience. Today I’m sharing the fun and gratitude of such a moment. Cutting up a bunch of fruit for a salad recently, I sliced into the first cantaloupe of the season and felt a rush of images fill my head. As a child I only knew this fruit with a bit of salt and didn’t appreciate it so much until I was older and enjoyed it unsalted. Every picnic I’d ever gone on, every campout, too, seemed flavored in the memory of this particular smell. I moved on to a small watermelon and cut into the thick rind releasing the heady summer scent. Even the sound of the rind giving way, the sudden rush of juice on the countertop added to the sweetness of the moment. Then the colors caught the light just so and I reached for my camera. The berries, blue, red, black, each held within their compact little packages a burst, a pop, a firework of taste memory. Although I must admit there’s nothing like a berry just picked off the vine and slipped between your lips. Oh, my. Nothing at all. But these store-bought beauties still tingled the senses. Even the grapes seemed to shine in the kitchen light and bask in the bouquet of other scents mingling in the air. A squeeze of half a lemon, and another of a quartered lime over the glass bowl of color, memory and anticipation, and my artwork, ahem, I mean, my salad, stood ready for a quick snack. I’m stunned at the variety of fruit available to me when I walk into the grocery store. I love the sound of the French word for “incredible.” The very pronunciation of it expresses incredulity, surprise, and appreciation. That’s how I felt making a simple fruit salad. That’s how I’d like to feel every time I experience the bounty in an American grocery store, the providence of my refrigerator, and the blessings of my own sweet life. Friday Letters: Pancakes and Waffles and Children, Oh My! So today’s the day. My first official Friday Letter to my kids. I guess I’ll just jump in with both feet. We’ve eaten some interesting foods over the years, many of which became favorites. A few we discarded before they even had time to cool completely. But, you gotta admit, I can cook up a pretty good meal. I apologize for the Salmon Patties. That involved some desperation and not much experience or innovation. Luckily, the Spinach Lasagna incident only two of you had to endure. I’ve since learned that better recipes exist for those particular concoctions that turn out deliciously edible. Let’s not forget the forgotten corn from Thanksgiving that we discovered the day after. And those flaming peas in the microwave made quite a stench. I think I’ve blocked out most of the other gastronomic catastrophes. Feel free to remind me in a private message or an email. No need to share them all in public. My pancakes never made it up to snuff in my opinion. There’s that whole practice pancake idea that irks me some. You know, the first pancake will simply turn out raw on the inside, burnt on the outside or funky and not very yummy looking. All those pancakes after the first turn out great. Or in the case of my particular pancake cooking abilities, edible but not stellar. Shouldn’t every pancake turn out the same every time? Why does that first one have to serve as a sacrifice for the rest of the batter that follows? And then, even after that first pancake, I never felt like mine had the delightful taste and texture of Denny’s or IHOP. (Too high of a standard maybe?) So I rarely ate the pancakes I cooked. If we had homemade raspberry jam, then, okay, I had a couple. Bacon on the side served as a kind of apology for the lack of quality in the pancakes. There’s a theory out there in parenting that equates first children to practice pancakes. The idea plays out with the idea that parenting gaffes and goofs and idiocy only happens with the first child, who somehow survives or becomes scarred for life, but the rest of the children that follow turn out okay because of the sacrifice endured by the firstborn and lessons consequently learned by the parent. Children and food don’t compare in any way, shape or form. Food doesn’t interact, respond or run and hide in a closet. Food doesn’t cry in the middle of the night. Food doesn’t snuggle with you and make you feel like everything’s going to be all right in spite of the chaos and mess. Bacon. Apology or bonus? It depends. Even if you accepted the food/child comparison, parents learn only the first couple of chapters of parenting wisdom from that first child. For instance, we learned to relax a little bit after stumbling through J1 and arriving at J2. (Yes, I know, emphasis on the word little.) One of your parents learned to relax sooner and more convincingly than the other one. There are lessons learned with each child, some more dramatically or hysterically than others. Each of you came with your own ‘lessons Dad and Mom need to learn from parenting me’ agenda. Rarely did one child-raising experience intersect or lend itself to the child-rearing experience of the others. I have a different theory, a better one than the practice pancake theory. It’s more like how my waffles turn out. Yes. Every single waffle a masterpiece, delicious, fluffy, crisp and tender, warm and welcoming. I can practically smell the melted butter in each little square, the warm syrup puddling. Bacon is optional with waffles. Perfection. That is until that final waffle. I always, always, always burn the last waffle. I sit down at the table, dig into the succulence of waffle nirvana and forget to check on the last one. Even if I set a timer, I’m so enamored of my plate of perfection that I think to myself, I’ll get to that in another bite or two. Before I know it I’m dishing up another waffle, downing a glass of milk, reveling in the particular happiness of breakfast carb overload. Then I realize, too late, that the last waffle has crisped to a dark, dreadful crunch that shatters on fork approach. What does that have to do with parenting children? Each one of you have been your own kind of sumptuous waffle delight to me. I’ve gotten so caught up in the joys and work and business of parenting at times that I’ve neglected or ignored the warning signs, the red flags, the obvious pitfalls. Yup, I’ve made mistakes. Probably the same ones over and over, without learning from them. But you all turned out amazing in spite of your parents, not because of us. Pay attention to the timer. And, no bacon required, no apology needed. Now, you’ve all added a delightful side dish of a companion who adds dimension and delight to our family. Like, bonus bacon! I feel like a master chef. The secret is you’ve all managed to do your own cooking, I just stirred up a few ingredients and look how you turned out! So, what about that last waffle? Well, that’s me. I never really learned to pay attention to my own needs. I tended to push myself past my limits until I got a bit burned out. Staying up too late, getting up too early, saying yes to every request, trying to do it all and be it all. That’s not a smart way to function. It leads to dysfunction. Sorry about that part of things. I wasn’t always at my best for you. I’m hoping you learn not to burn that last waffle. I hope you pay attention to your own internal timers, bells, whistles, needs and wants. Keep things balanced and enjoy your own life as you raise your own little munchkins. Good luck with that. Thanks for letting me experiment in the kitchen of life with ya’ll. It’s quite a delicious and always surprising treat. Until next Friday, I’ll be thinking about you, worrying about you and loving you! It’s Gratituesday! Today I’m grateful for Chocolate! What food group better addresses my emotional needs? None. If decadence had a flavor it’d be chocolate. Don’t you agree? You know, it is American Chocolate Week here in the United States, March 16-22. Not that I find American chocolate all that amazing, it’s not really one of our strong points. I think of it more as a holiday wherein Americans celebrate chocolate’s wonders, magic and joys. Hot Chocolate with hazelnut. Ahhh. Chocolate can gentle me awake on especially groggy mornings. Hot, in a mug, with a dash of hazelnut and cream, its soothing heat penetrates and slowly shakes the Sandman’s dust from my brain. Once a daily ritual, it’s now become seldom, more special in its rarity. I’ve experienced chocolate in a main dish, which is surprisingly not as weird as you’d think. A Mexican wonder of rich spice and complex flavors, Mole adds an interesting twist to an often overtired food genre. Has anything escaped being dipped in chocolate? I think not. From my earliest memories of a chocolate dipped soft serve ice-cream cone, to my more recent love affair with chocolate covered cinnamon bears, I can only conclude that everything’s better dipped in chocolate. Cookies, cake, apples, pretzels, strawberries, pineapple, caramel, nuts, cherries, marshmallows all reach their natural order of perfection when joined by chocolate. Did I mention coconut? I should have mentioned coconut. Now I have. I suppose carrots and celery might not mix well with the creamy succulence of chocolate, but pretty much anything else ramps up a notch by pairing off with a bit of the creamy perfection of melted chocolate. Give me a box of chocolates and I’m your friend for life. Seriously. Keep in mind that I prefer milk chocolate to dark, unless mint gets involved. A box with a map included for navigating the hidden treasures beneath the twists and twirls and peaks of chocolate gift wrapping will make my heart go all a flutter. A chocolate factory in Phoenix creates what our family refers to as “manna,” also known as “the food of the Gods.” Cerreta’s turns the standard chocolate mint on its head by encasing a delightfully rich truffle in a blanket of green-mint-melt-in-your-hand-before-it-gets-to-your-mouth white chocolate. Oh my Hannah! You have to try one. Worth every penny you invest in them. I can make one last a good ten minutes by taking teeny bites and letting them simply sit on my tongue, becoming one with my taste buds, serenading my mouth. Another thin sliver of a bite slips over my lips, one after another, until ten minutes later, I’m finally, blissfully, practically in heaven. Mmm. One is enough for a while. The only thing close to Cerreta’s perfection is a Lindor truffle. The centers of those playful round orbs of Swiss chocolate seem nearly liquid. Just thinking about it makes me salivate. I figure Switzerland must be one of the happiest places on earth if it can produce such wonders and others like them. I may need to make a chocolate run here any minute now. Up close and personal with Texas sheet cake. Other favorites include the infamous Texas Sheet cake, which is mostly butter with some chocolate and sugar added for good measure. I can make myself content with any chocolate enhanced slice of cheesecake. Pour some ganache on a dessert and resistance is futile. MSH will occasionally arrive home from some errand and quietly slip a Cadbury fruit and nut bar onto my nightstand. I won’t see it until I’m tucking in for the night. Like an unexpected kiss, I feel cherished and known and cared for by such a gesture. Sometimes the small things bring a smile, turning the corners of my mouth northward. Sometimes it’s the sticky, lick your fingers kind of things that make me grin. Today it’s both.